Sleek, sophisticated gadgets in the living room, need equally chic media storage units. 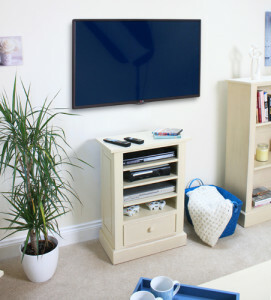 Here at the Wooden Furniture Store, we’ve chosen our best six Modern Media Storage Units which can house all you entertainment equipment with style and ease. 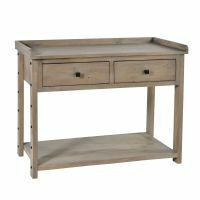 Made from solid, environmentally friendly mahogany, which has been given a distressed white paint finish, the Whitehaven large TV unit is designed to hold a 78″ TV. 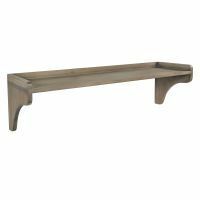 This is a beautiful piece of furniture with gently curving cornices and solid plinth detailing. 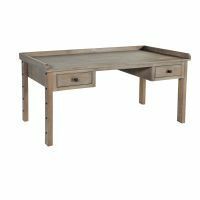 The unit features a two large open shelves on the right hand side with two pre-drilled wire holes and on the left two large drawers finished with metal cup handles. 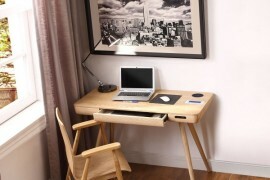 The unit is hand made to order (which takes 12 weeks) and is delivered fully assembled. 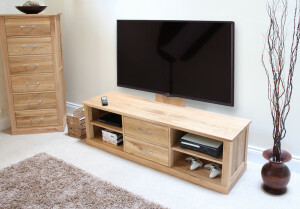 The Atlas Oak widescreen TV cabinet with doors would be a beautiful and practical addition to any living room, especially designed for a TV up to 100″ and is made from solid environmentally friendly oak. There’s plenty of storage in the cabinet with two large drawers in the centre and a cupboard at both ends, each with two fixed shelves inside. The units clean, solid lines are enhanced with matching oak handles and a soft satin lacquer which highlights the natural grain of the oak wood. When designing your living room it’s a good idea to consider ways to integrate media equipment into your home. The Cadence entertainment cabinet is the perfect option if you have a wall mounted TV and is designed to hold media units on four fixed shelves plus there is a large drawer. 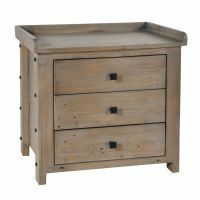 The cabinet is made from environmentally friendly mahogany which has been given a hand distressed cream paint finish for a “shabby chic” feel. The unit is a high quality piece of furniture and is designed to last a lifetime with pre-drilled cable holes, dovetail drawer joints and nylon feet to protect floor coverings. 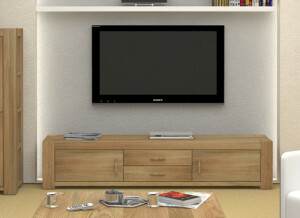 Display your media entertainment units with pride in the Mobel Oak mounted widescreen TV unit. This contemporary media storage solution has an ingenious design that includes an adjustable television mounted bracket which is built into the cabinet and designed to hold a television up to 52″. The cabinet itself has 2 drawers in the centre to house television controls or alternatively can hold DVD’s. On either side of the drawers are two openings which are designed to hold all ancillary equipment and the cabinet also has pre-drilled holes at the back to hide all wiring. 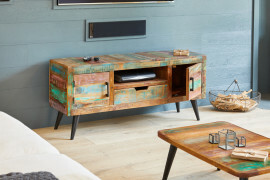 The widescreen television cabinet is made from solid, environmentally friendly oak and finished with steel coloured handles. 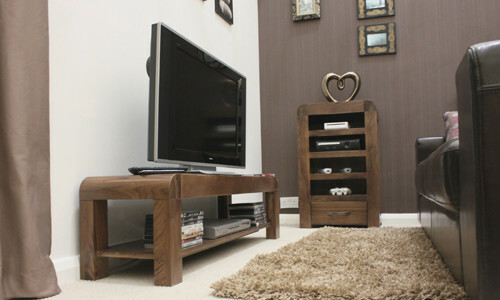 The Shiro Walnut low TV cabinet would bring stylish storage to any living room. 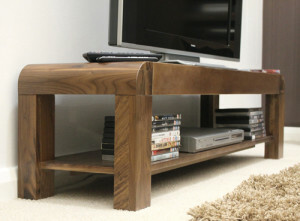 Crafted from the highest quality solid walnut, this walnut low TV cabinet is designed to hold a widescreen TV up to 72″. 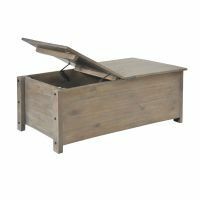 There is ample storage space with a single open shelf and the unit is exceptionally built in environmentally friendly walnut which is a high quality timbre with a dense grain. 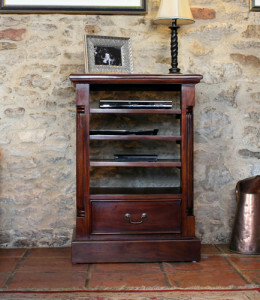 Hand crafted from solid, environmentally friendly mahogany, the La Roque home entertainment cabinet is a stunning design for more traditional style homes. The cabinet has four fixed shelves plus a single drawer and has been specially designed to house the media equipment used with a wall mounted TV. 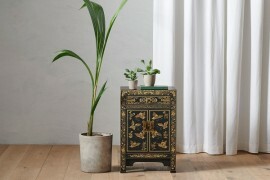 The unit is finished with a mid gloss lacquer to highlight the natural beauty of the wood and is further highlighted with antique brass drop handles. This post just highlights six of our television cabinets – to view the whole of our range please click here. All the TV cabinets featured are part of living room ranges that feature bookcases, coffee tables and lamp tables – to view our living room collections please click here. 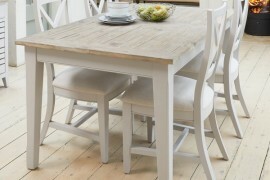 And remember all of our furniture is delivered fully assembled within 10 working days so it’s time to get #houseproud!